Stock newsletter editors were on average unchanged from last week: bulls 41.4% and bears 29.9%. The weekly retail investor sentiment survey from AAII shows a sudden jump in optimism: the bulls came in at 38% - a 10% point jump from last week. While the bears are 45% of respondents, a drop of 4% points from last week. It is difficult to parse the meaning of this move back and forth. First much more bearish, now decidedly less so. Since we didn’t really reach any levels of historical significance with this sentiment indicator, the only thing we can safely say is that retail investors are skittish but not despondent. This is among Richard Russell’s favorite indicators. 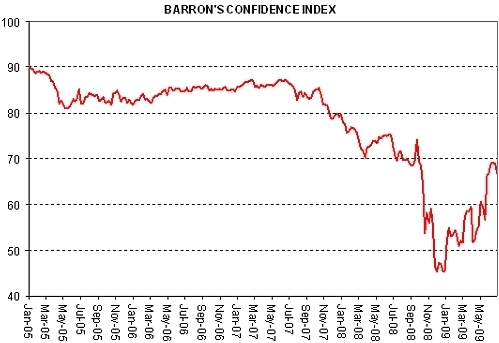 The Barron’s Confidence Index is a ratio between Barron’s high-grade corporate bond index and Barron’s intermediate-grade corporate bond index. So basically it shows how much or how little demand there is in the more speculative, lower grade bond market. But since the low late last year, the credit market has improved and we are now trying to return to normalcy. There is a high correlation between this indicator and the equity markets, which is why Russell follows it so keenly. It can be considered a good proxy not only for the bond sentiment but for the over all appetite for risk. There are many indications which confirm this point of view, for example the return to earth of the TED spread. You can follow the indicator by rifling through the pages of Barron’s print edition or you can alternatively find it online. After watching their savings evaporate and their net worth plunge, many are giving up on retirement planning. The graphics is a clever play on the falling stock market, in a thick red line… which transforms into a beach lounge chair. On the whole it isn’t ’slash your wrists’ or ‘Death of Equities’ gloomy but you have to wonder if this kind of cover would have even been contemplated in 2007.